A t-shirt and pair of shorts/pants. Those are the minimum things that I look for in a bag. Other niceties are things like someplace to put extra books, roller wheels (hey, sometimes my shoulder gets tired), internal structure, tie and belt compartments, lightweight, etc. I took the Rick Steves’ Convertible Carry-On on my trip to Dallas. I’ve had it for a while but just didn’t put it to much use. So I pulled it out of the attic and opened it up. The bag is at the maximum allowable size for carry-on luggage by most airlines, which makes the interior cavernous. Also it expands a couple of inches. As far as carry-ons go, this is as big as you’re likely to find. I put all of my stuff in it and still had room to spare. There was a good amount of room for my suit and business shirts and I locked them in with the internal straps so they wouldn’t go anywhere when I slung it on my back. Unfortunately everything else sagged to the bottom. The bag is kind of lumpy and awkward. Even filling it up took effort as I had to lay it out, move it around, fit my clothes in, and move it around more. It’s like filling up a grocery sack – if you’ don’t just cram stuff in it’s not going to be pretty. And wearing it around felt funny. There’s just no structure to it or anything. Fits anything you’re likely to carry, short of a VW. Conclusion: If it’s fully packed out, this bag is probably great. But nearly empty it’s just cumbersome. I’s built for trecking across the globe so that’s no surprise. The bag is very light so that’s also good for long hauls, especially in the Winter when you’ve got to pack lots of bulky stuff. But at that point you would probably be better off just grabbing a frame pack and going with that. I stand by my original thoughts, for the most part. It’s a huge bag. If you haven’t filled it, everything can kind of sags to the bottom. But I found that the side straps actually help a lot to take up some of that slack. WIth the addition of some packing cubes, a shirt folder and some creative packing you can actually manage to keep most things in their place. But it’s a much better bag than I gave it credit for initially. It’s super versatile. And it’s incredibly light, too. I originally gave the bag a C but I take it back. A good alternative is the eBags eTech 2.0 Weekender Convertible bag. 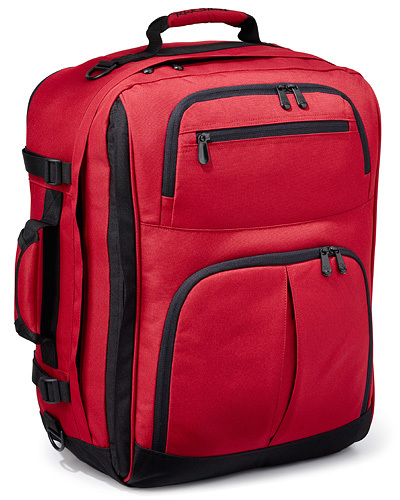 This one has more structure to it and is slightly less expensive but is very similar to the Rick Steves’ bag reviewed here. If given the choice I’d stick with Rick, but I owned the other bag and it’s very good too.